Every artist seeks inspiration, and this was certainly true for Carl Fabergé. After attending the Fabergé Symposium in January of this year and listening to his great-granddaughter, Tatiana Fabergé, speak, I was initially surprised by what she was showing us. However, once I considered the artist that was Fabergé, her presentation came into clear focus. Tatiana presented various screen shots of objects found in Dresden, Germany, as well as work completed by Fabergé. What was so shocking, you might ask? It was the eerie similarities of older, famous items to renowned Fabergé pieces. These works of art, side by side, were almost identical. 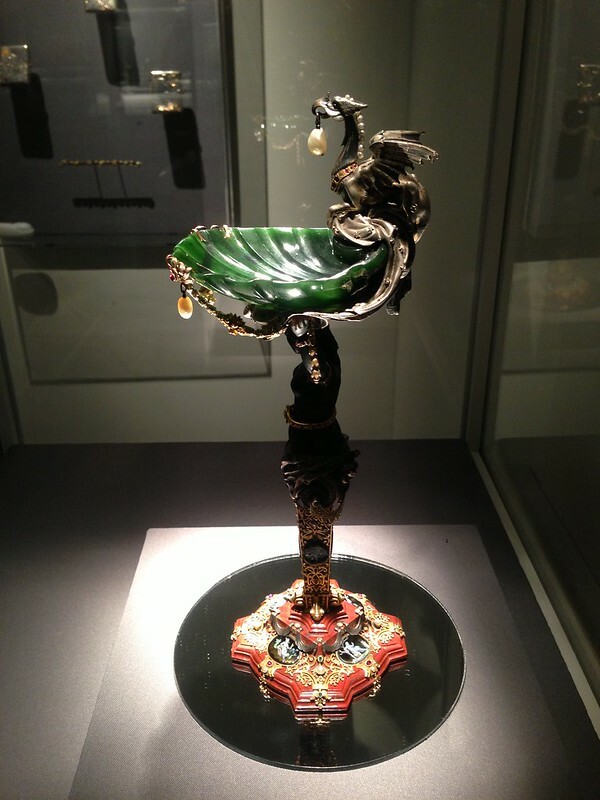 Although to be fair (or maybe a bit biased) the Fabergé pieces were just a little more beautiful. My first shocking thought was that Fabergé might have made a job out of creating replicas. However, after continued study of the objects in the presentation, I began to see what was unique to Fabergé. It became evident that he did not steal designs; he was inspired by them and created something even more beautiful and, in some cases, more functional. Like any good artist, Fabergé sought inspiration outside of his own sphere, using what he found to create stunning, unique pieces. Tatiana went on to explain that her great-grandfather had been sent around the world to study the best types of jewelry-making and goldsmithing. However, it was when his family moved to Dresden that Fabergé would find significant inspiration. The city had treasures of baroque art that could stir the imagination of a young artist. 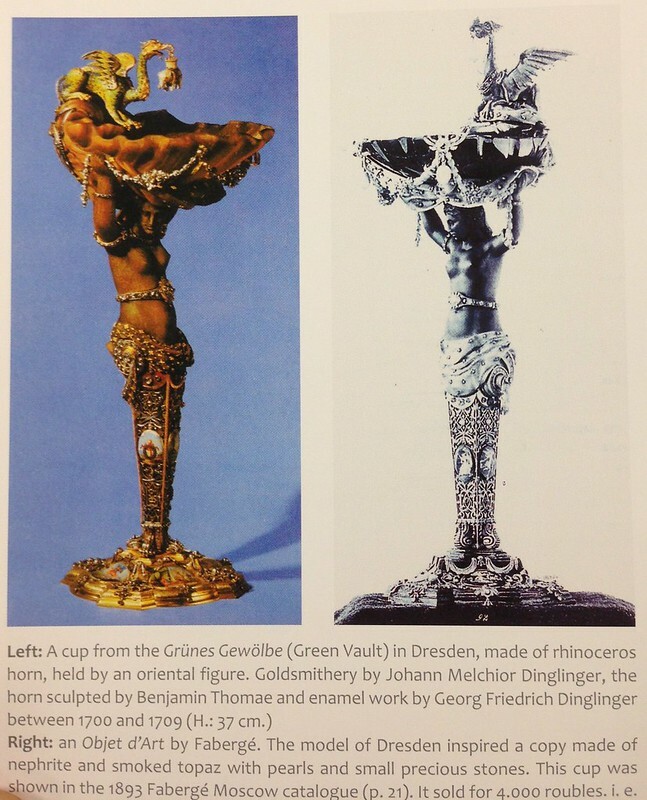 One piece Fabergé studied that is of interest to us in particular was a cup made of rhinoceros horn, held by an oriental figure. The Houston Museum of Natural Science, with gratitude to the McFerrin Collection, has the honor of displaying the object that was created from this inspiration. This particular statuette, a near replica, is made of nephrite and smoked topaz with pearls and small precious stones. It was shown in the 1893 Fabergé Moscow catalog and sold for 4,000 rubles, the same amount the Russian Royal Family paid for a single Imperial Easter Egg. It is uniquely Fabergé, yet German baroque art as well. Visit the Houston Museum of Natural Science’s Fabergé: A Brilliant Vision to see this object among others that Fabergé sought to create in his own style.